I sometimes wonder why I don’t get bored going to the same birding locations month after month, year after year. A big part of it is that, on any given day, there is a chance that they will see something different or rare or perhaps even totally new. This past Sunday, while on an organized outing with a bunch of local birders to Buttertubs Marsh Bird Sanctuary in Nanaimo, I got my “something-new” fix. In this case is wasn’t a new species of bird — instead it was an inter-species interaction that I had never noticed before – that of an American Wigeon stealing food from an American Coot. The first of the two species, the American Wigeon (Anas americana), is a duck that is part of the genus Anas sometimes referred to as dabbling ducks. These duck may feed on land or on the water where they can tip themselves upside down and gather underwater plants up to several inches below the surface. The second of the two species, the American Coot (Fulica americana), is in the family Rallidae of rails and looks a little like a small black chicken. 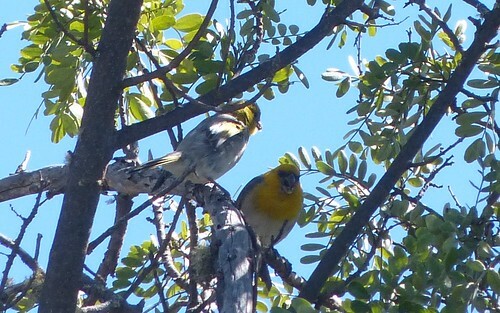 These birds may feed on land, by dabbling in shallow water or by diving for plants. At one point there were at least 3 or 4 Wigeon-Coot pairs doing similar food-stealing dances. On another occasion I watched as a Wigeon tried to manage two Coots at the same time and seemed to spend a lot of time in the middle trying to decide which way to go. Not a good strategy for a low-intelligence bird it would seem. A 1979 article suggested that the Wigeon is the only duck known to be a regular kleptoparasite (ref ). A 1984 article documents Gadwalls stealing food from American Coots (ref ). Other ‘dabbling ducks’ in the genus Anas include the Mallard, Wigeons, Teals, Shovelers, Pintails, the Black Duck, the Gadwall and a few others. Wigeons apparently will try to steal food from other diving water birds, not just from coots. Coots, in turn, have been known to steal food from other water birds. Coots will also dive to escape predators (the Coot is one of the easiest birds for the Bald Eagle to catch). A good source of information that I like to use is the Birds of North America online service from the Cornell Lab of Ornithology. The service is not free but for anyone curious about bird behaviour it’s worth the price in my opinion. They have a one month subscription that costs $5 if you want to give it a try. BNA online article on the American Wigeon. BNA online article on the American Coot. Juan A. Amat & Ramón C. Soriguer, Kleptoparasitism of Coots by Gadwalls, Ornis Scandinavica 15: 188-194. Copenhagen 1984. 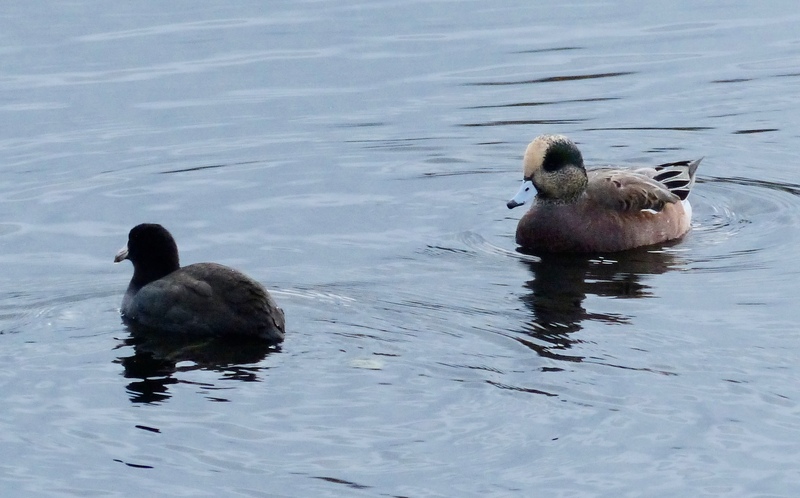 This entry was posted in Bird Behaviour, Cool!, Kleptoparasitism, Pictures, Research, Video and tagged American Coot, American wigeon, Anas americana, behaviour, Birding, Buttertubs Marsh, Foot stealing, Fulica Americana, kleptoparasitism, Nanaimo on 2015/11/11 by KevinHHood. A recent week-long vacation took us to the Hawaiian Islands (October 26 to November 1). Having previously been to the island of Kauai at the old end of the island chain, we decided to try the island of Hawaii at the other, newer end. To prevent confusion with the state of Hawaii this is frequently referred to simply as the Big Island. I had my Panasonic FZ-200 camera along to document the trip. 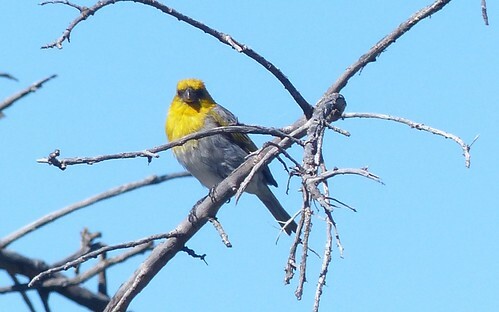 On the last full day, I signed up for a Rainforest and Dryforest Birding Adventure tour — a day-long outing put on by a tour group called Hawaii Forest and Trail. They do many other tours too that are not just for birding. The rest of our group, for instance, went on the Mauna Kea Summit and Stars Adventure trip which takes you up to the volcano’s summit to watch a sunset. Our trip set out in search of 2 specific target birds. 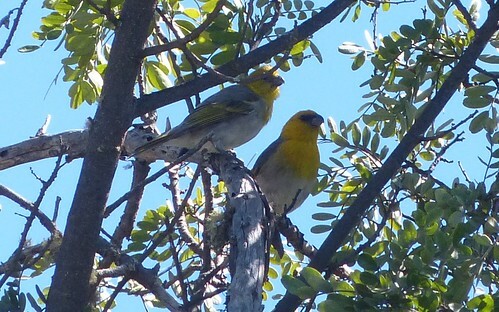 In the dry forests on the side of Mauna Kea we would be looking for the Palila, a critically endangered species which lives in a single forested area on the volcano’s slopes. This forested area is the source of the māmane plant which the Palila has adapted to be able to eat and which is toxic to other birds. In the second part of our excursion, we would travel to some wetter forests where we hoped to find different endemic, the ʻAkiapōlāʻau. 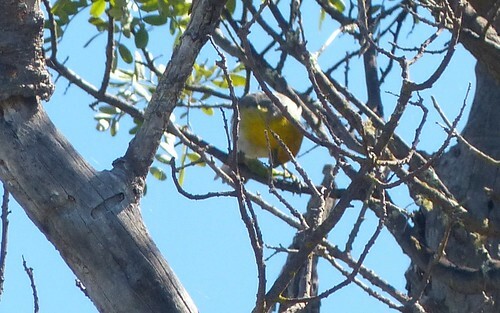 While we were, unfortunately, unable to track down the ʻAkiapōlāʻau, we were extremely successful with the Palila and the rest of this article describes that encounter. 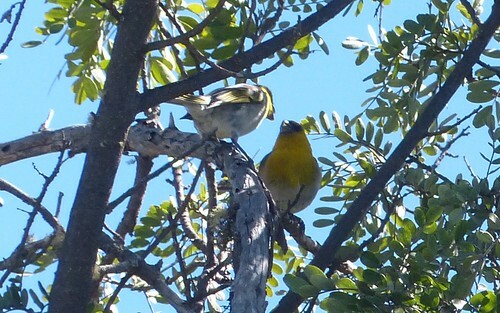 First, a quick note and the Palila habitat on the slopes of Mauna Kea. Mauna Kea is still considered to be an active, though dormant, volcano and even though it has not erupted in 4600 years there is still the slim possibility that a lava flow from a future eruption could wipe out this habitat leading to their extinction. While this might make for a good story in Hollywood, the reality is that there are much more dangerous risks that could well see the Palila gone from these slopes long before they are touched by lava. Forest fires, for instance could, in the right conditions, very quickly destroy the Palila habitat. Other threats include introduced species of plants, animals, insects and disease. 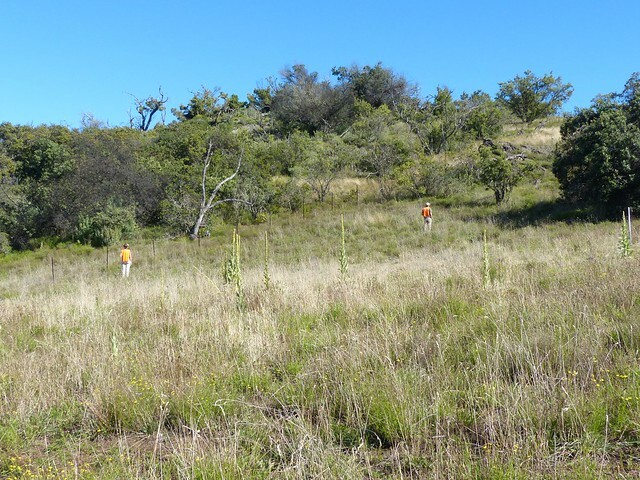 The Hawaiian government’s Mauna Kea Forest Restoration Project has lots of good information here. 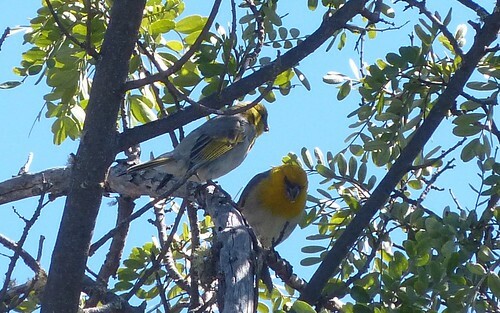 Finally, according to BirdLife International, the endangered status of the Palila in recent years is also related to rapid population declines as a result of drought that has affected its primary source of food, the māmane plant. The plan was simple. 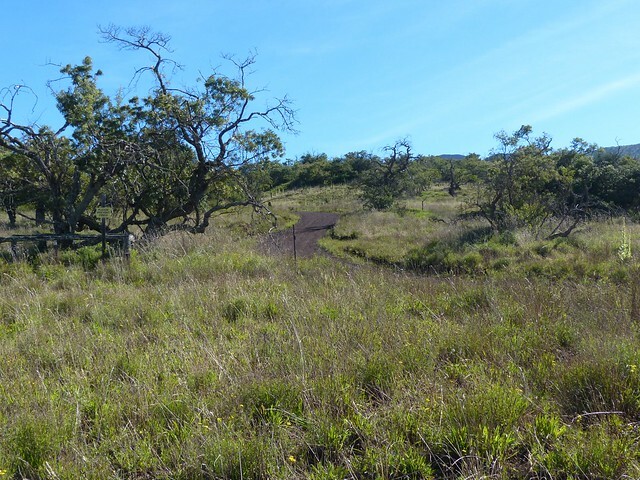 We parked in an area accessed by a hunter access road on the lower slopes of Mauna Kea. The trip organizers allowed for up to 4 hours climbing the slopes to find and view the Palila after which time, win or lose, we would head for the second location. 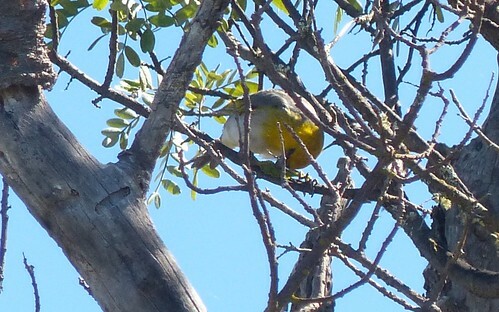 Here is a picture taken near our parking spot and at the lower edge of the area expected to contain the Palila. Note the sparse trees on fairly open grassland. Here is a second shot taken as we climbed a little further up the Mauna Kea slope. According to the guide, on one recent trip they spent most of the allocated time hunting for the Palila and only found them as they were about to quit and move on. 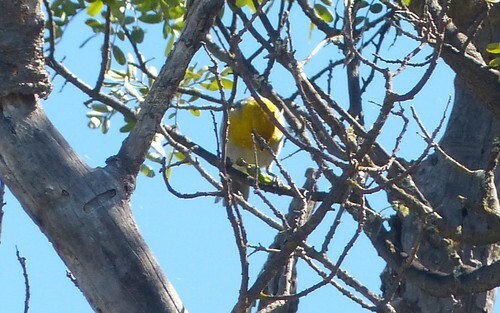 We got lucky and found one after about 15 minutes with another pair showing up shortly thereafter. In fact it appears that we had found a family unit with male, female and juvenile foraging together. The juvenile showed typical begging behaviour with fluttering wings and an adult was doing the foraging and feeding of the juvenile though regurgitation as described, for instance, in a Palila wikipedia article. This article says that both adults will regurgitate to feed the young in our case the male was feeding while the female stood guard, presumably looking for predators. If the wikipedia article is correct then perhaps they take turns feeding and guarding or perhaps the guarding behaviour only happens occasionally, for instance when a large number of two-legged, orange-vested homo sapiens are also foraging in the area. If we only consider predators seen historically before the arrival of man on the islands the most likely candidates would probably have been the Hawaiian Short-eared Owl (Pueo) and the Hawaiian Hawk (ʻIo). 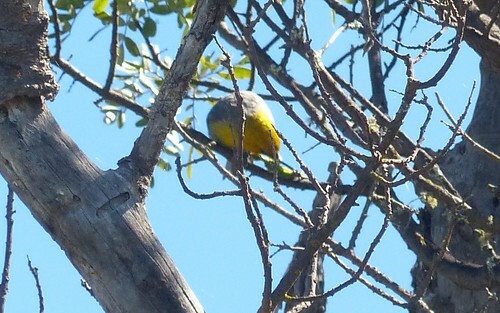 It is not clear what threat we birders posed to the Palila though it was clearly not enough to drive them away. Whether or not the female would have stood guard where and when she did if we had not be there is unclear. 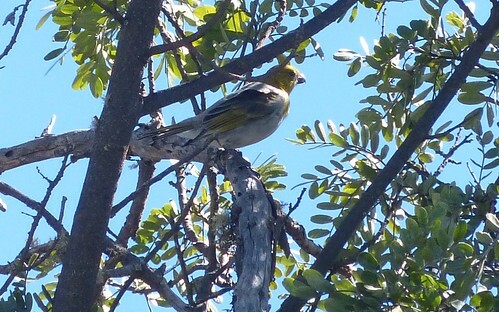 As mentioned earlier, introduced predators are currently one of the Palila’s biggest threats. These include feral cats and black rats (see for instance this article on the Palila from BirdLife International (birdlife.org). Mosquitos transmitting avian malaria have also proved very dangerous to the endemic populations of birds. They are also threatened by habitat degradation especially if it affects the growth and spreading of their primary food sources, the peas from the seed pods of the māmane plant and certain types of caterpillar. Introduced mammals such as sheep and pigs are particularly bad for disturbing the forest plants. Through hunting and fencing the threat of these has been reduced. First Sighting: An adult male processing a māmane pod. 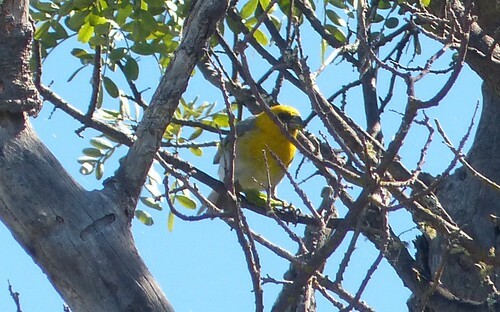 Our first sighting of a Palila was that of an adult male who was processing a māmane pod in the middle of a bush that provided the bird with some protection. The following 7 pictures, shown in the order that they were taken, cover a period of about 9 seconds. All of these pictures were cropped from the original size of 4000 x 3000 down to about 1200 x 800. The displayed images below are shown at a resolution of 640 x 400 though the full-sized cropped images can be viewed clicking on the image and following the link back to Flickr. The following is a short video that was taken starting 10 seconds after the last picture (above) was taken. You can hear the group leader describing the bird to some of the birders that were just then discovering it for the first time. 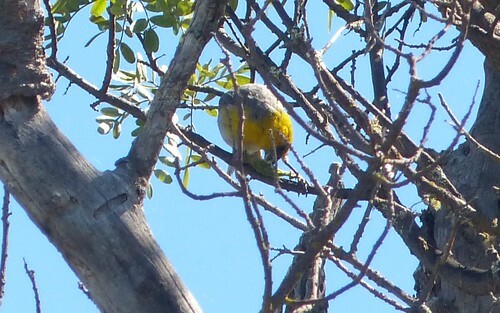 Initially you can see the Palila alternating between working on the māmane pod and raising it’s head up to check its surroundings. You can also hear the Palila in between the periods where it is working on the māmane pod and also after it appears to be done having released the māmane pod. Perhaps these calls were communications to the other family members that would be showing up in the seconds that followed the video. There may even have been a specific message to the juvenile that he (the adult male) was full and that it was time to eat. This might also explain why he dropped the pod. It’s not clear why they moved to a different location for the feeding. Perhaps it was because of our presence or perhaps because it is generally safer to keep moving. Unfortunately there is a half minute gap between this series of pictures and the next series with adult feeding juvenile. The only thing that I recall from this period is that the juvenile and adult female arrived to join the adult male and then the female left again. Second Sighting: A juvenile begging and being fed by the adult male. The second set of 7 images were taken over a period of 13 seconds starting 63 seconds after the last picture in the first set or about 38 seconds after the end of the short video. As mentioned, in these 38 missing seconds the male moved to a different perch and a juvenile and an adult female flew in to join the adult male. Only the juvenile stayed to be fed by the adult male while the female flew off to, it appears, stand guard (see the third sighting section below). The sequence between the adult male and the juvenile clearly shows the begging behaviour as well as the regurgitation and transfer of food from adult to juvenile. The final image was taken 5 seconds after the previous one and shows the juvenile left alone and somewhat hidden in the foliage while the adult male had moved on, perhaps to start a new cycle of processing māmane pods prior to the next feeding cycle at which point he would call the juvenile to join him there. Third Sighting: An adult female on guard duty. The third set of 5 pictures were taken over a period of 24 seconds starting 18 seconds after the last image in the second set. The adult female Palila, which made a brief appearance off camera took up a position 100 feet or so from where the other two birds were positioned. Her perch at the top of a bare branch gave her good visibility. She chose a bush that kept all of the birders, which had broken into several groups by this time, on one side of her, perhaps in order to be able to see all of them at once without continually having to look in opposite directions. As the photos show, she still does look away from time to time, perhaps scanning for other possible threats. As mentioned previously, the two historic threats where probably the Hawaiian Short-eared Owl (Pueo) and the Hawaiian Hawk (‘Io). At this point in our trip we had already seen 5 of these owls hunting (one near where we found the Palila) and we had one unconfirmed hawk sighting. 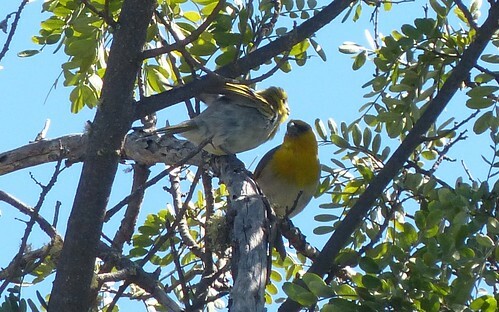 I was impressed by the fact that both adult Palilas were caring for what was clearly a juvenile bird. The splitting of the task of feeing the young was split into roles of foraging and standing guard. It would have been nice to know if they switched roles from time to time. Many species, particularly migratory ones, leave their young to fend for themselves at a much younger age or only one of the adults take responsibility for the young. I acquired my Panasonic FZ-200 camera to help with bird identification but on several occasions it has proven useful in seeing behaviours that I would never have noticed using just binoculars. The ability to capture large numbers of pictures and even videos with sound provides the opportunity to analyze different aspects of bird sightings that happen too quickly in the field. Take more pictures and make more use of burst mode. You can always delete them later. Take more video clips. Images can be extracted from these videos though not with the same resolution. Video also records sound which can be useful in understanding bird behaviour. Bring a tripod. A remote control cable might be useful as well for the still shots. Make sure that the memory card is fast and has lots of space. Bringing extra fast cards will encourage taking lots of pictures and videos. Add a directional microphone that plugs into the audio in jack on the camera. Get more people involved. It would be interesting to see if better behaviour could be captured with a coordinated group of birders taking pictures and videos together. The camera clocks would obviously need to be either calibrated or synchronized to help determine the order of various events. It was a fun way to get introduced to a new bird and, while it took a lot of time post-processing, it was definitely more satisfying than a brief sighting and a simple pencil mark on a checklist. The Palila article on Wikipedia. 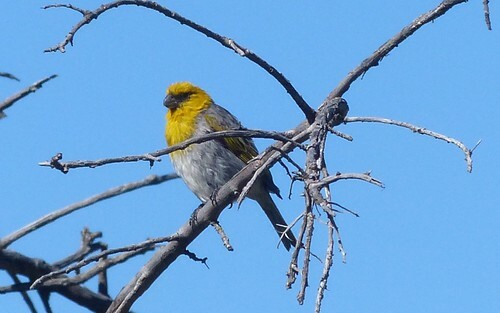 The Palila Status at BirdLife International (birdlife.org). 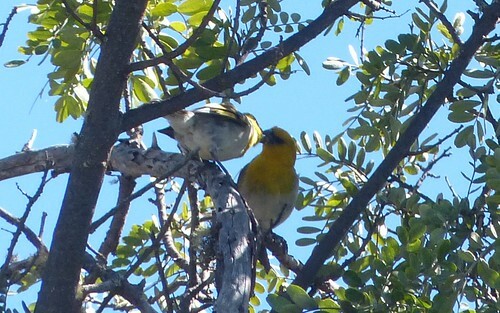 The Mauna Kea Forest Restoration Project website from the Hawaiian state government has much more detailed and accurate information on current status and threats to the Palila. The Facebook page for “A Paradise Lost”, an animated movie about the Palila directed by Laurie Sumiye. This entry was posted in Bird Behaviour, Birds, Cats, Day Trip, Endangered, Equipment, Habitat Destruction, Hazards and Mortality, Pictures, Raptors, Research, Songs and Calls, Species, Travel, Video and tagged avian malaria, Big Island, Bird, Birding, Hawaii, Hawaii Forest and Trail, Hawaiian Hawk, Hawaiian Owl, Mamane, Mauna Kea, Palila, Travel, Vacation, volcano on 2014/11/10 by KevinHHood. What reminded me of the video clip was a wonderful sequence of river otter pictures recently posted by a fellow member of the Fraser Valley Birding forum who is also a great photographer. I also created the following YouTube version of the River Otter video. The footage for the video was taken in Town Centre Park in Coquitlam, BC. We’re not sure how the otter got into “Lafarge Lake” (the name for the glorified pond on the site of an old quarry) however we do have a pretty good idea why he liked it there. Except during the hottest months of the year, the pond is stocked with fish for anyone to come and try to catch. For the otter, it’s a free buffet in addition to all of the yummy things that occur naturally in the pond such as the crunchy morsel with claws that it is eating in the video. River Otter in Lafarge Lake, Town-Centre Park, Coquitlam, April 2013. Copyright 2013, Kevin H Hood, all rights reserved. The camera was hand-held during the recording and Adobe Premiere Elements Video Editor (version 11) was used to touch up the original footage and to publish it to YouTube. The original sound-track was filtered to reduce background noise but was otherwise left untouched and consists of background (city) noise, a crow calling and, if you listen carefully, something that might be the sound of the otter crunching on its snack. This entry was posted in Fun, Video and tagged "Lafarge Lake", "River Otter", "Town Centre Park", Adobe Premiere Elements, Coquitlam, Panasonic FZ200, YouTube on 2013/12/08 by KevinHHood. My second outing with the Ken ‘s Birding Photography class took place August 31, 2013 and started in the same place as the first, at the Reifel Migratory Bird Sanctuary. This time it ended at the Tsawwassen Ferry Terminal along the South side of the spit. One of our last sightings was a small group of 5 Harlequin Ducks that were slowly working their way down the length of the spit. Besides lots of pictures, I took a minute long video with my camera that was sufficiently entertaining that I dressed it up using Microsoft Movie Maker, added some music (to replace the sounds of automobile traffic and birder chit-chat) and made it available for general consumption in the video window below and on both Flickr and YouTube (my first ever YouTube video). The streaming from Flickr and/or Youtube may not be very smooth so downloading a copy from the ‘Share’ menu or from one of the versions on Flickr and watching locally should lead to a noticeably better experience. This entry was posted in Bird Behaviour, Cool!, Fun, Pictures, Research, Species, Video and tagged BC Ferries, Flickr, Harlequin Duck, Tsawwassen Ferry Terminal, YouTube on 2013/11/03 by KevinHHood.